There’s really no secret to keeping your child’s teeth healthy — good, daily hygiene habits, regular dental visits and early treatment for emerging problems. It’s a lot easier for those things to happen if your child feels comfortable with dental care and visiting the dentist. Sadly, that’s not always the case: many children develop an unhealthy fear of the dentist because the initial relationship may have been mishandled. Here, then, are 3 tips that will help you foster a healthy relationship between your child and their dentist. Visit the dentist before their first birthday. From a health standpoint, dental visits should begin soon after your child’s first teeth emerge (erupt) in the mouth. Visiting the dentist by their first birthday also improves the chances they’ll develop a sufficient level of comfort with the visits, more so than if you waited a year or two longer. Choose your dentist with your child’s sense of security and comfort in mind. When you’re looking for a dentist to care for your child, think of it as looking for a “new member of the family.” It’s important to find an office environment that’s kid-friendly and staff members that work well with children. Some dentists specialize in pediatric dentistry and many general dentists have additional training in working with children. 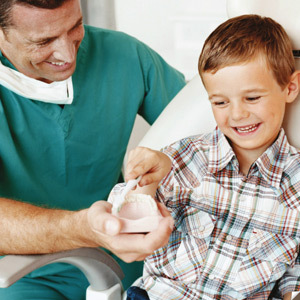 The key is a dental team that has a good, trust-building rapport with children. Set an example, both in the home and at the dentist. Children learn quite a bit watching what their caregivers say and how they react in potentially stressful situations. If dental care is important to you personally, it’s more likely to become important to your child. And when you visit the dentist with your child, be sure to project calm and a sense that it’s routine — if you display tenseness or nervousness your child may take that as a sign that visiting the dentist is something to fear. You want your child to learn that the dentist is their friend who’s there to help them. That lesson should begin early with the right dental team — and by making dental care a priority in your own life.